In today’s show we revisit our most popular interview to date. Tammy Kling had so much to offer when we talked at the start of the year, we wanted to revisit the episode. When we think about growing as leaders and as people, and as we take the next step in our careers, what does that path look like? We spoke to Tammy to answer those questions and more. Tammy Kling is a coach to the coaches. She’s a New York Times bestselling author, she’s a sought after speaker – her TEDx talk, ‘Words Are Currency’ have inspired and motivated countless people on the importance of how to use their words. Are we living our legacy now or do we find out what it is? How do you have confidence and believe in yourself that you have a legacy? When Tammy had written her 10th CEO book, she was sitting in the office of a successful Chief Executive – someone with sports cars, private jets and a house on an island – who was weeping. The CEO said that after building his company, he wanted to know how he could give back. Would that be by helping to serve the homeless, writing a book to educate the next generation, or something else? As he sat in his office crying, Tammy realised that you don’t have to wait until late in life – after you have become a success materialy – to find yourself, discover who you are, and decide what your legacy to the world should be. Often successful leaders have not discovered their legacy yet. 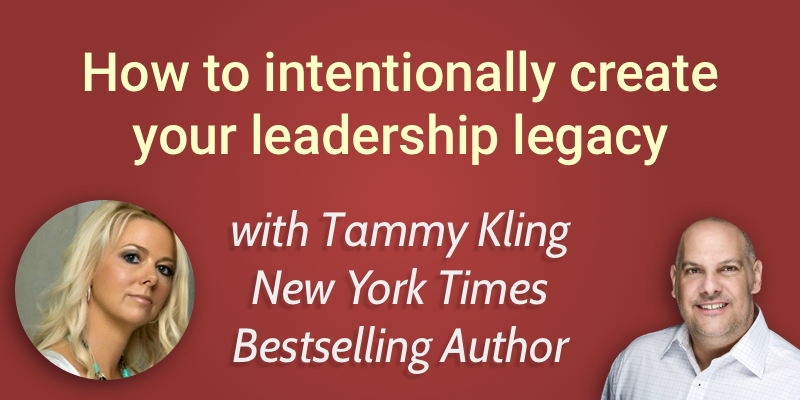 Tammy impresses the importance of finding a purpose that develops that legacy and impacts the way you lead in your life and business. A lot of people would answer that question by saying ‘we’re living our legacy every day.’ While that may be true for many of us, the majority of us go through life without intentionally thinking about our legacy – we focus on our business, on our knowledge and expertise. Tammy often meets people like this that by the end of their career find themselves wanting to give back, to leave that lasting legacy, but unsure what that looks like. She gives the example of a retired NFL player that has had a successful career, but now is done with football – it’s not his life anymore – and wonders what he should do. So instead, if we’re intentional about stepping back, taking time alone to discover our life’s purpose, at that point we are able to live our legacy. Tammy doesn’t believe in the idea of everyone having a story or a book in them. We guard who we learn from, so you have to be confident that you are able to contribute something positive to the world, which makes this an important question. It’s important to really listen and try to understand a way that we can impact the world. That may not always be in the discipline that you focus your career around. If you’re intentional and take time to reflect, listing out what your unique gifts are, you can develop an idea of what your legacy is and feel confident in it being a part of you and your life. For example, Tammy worked with legendary golfer Chi-Chi Rodríguez. Everyone thought his legacy was golf, but in fact golf was just a tool to help him live his passion and legacy which has always been to help orphans and underprivileged kids. Your legacy may not have anything to do with the career you are in. You are not what you do. You are what you are. When you are in your professional life – whether that be on the golf course, the football field, or the boardroom – we feel comfortable there. But taking ownership of our personal legacy can be different. The first step, says Tammy, is to break through your limiting beliefs about what your leadership legacy is. Tammy tries to challenge that as a limiting belief. Kids are your responsibility – you are responsible for raising them and teaching them good character traits and values, but they are not your legacy. You are going to train them to develop their own unique legacy. Or similarly, a VP saying that their legacy will be to bring innovation into a company could be a limiting belief. Again, Tammy reminds us that we are who we are, not what we do. So it’s about clearly defining what a leadership legacy could be for you without limiting yourself. The second step is to list out your top 3 unique gifts, independent of your career, to identify how you can impact people regardless of your profession. When we all learn to use our words, we are very young. And as we go through life we maintain the same sense we have as kids of not being intentional about our words. Proof of that is the multi-million dollar self improvement industry. The books and teachings and products about being a good presenter or sales person. Our companies pay for us to take training to use our words more effectively. We can convey powerful messages with our words, and without intention, they can be misunderstood or misrepresented. So what Tammy means by ‘your words are your currency’ is that if you are more intentional about our words you can change or even save lives. Which is a huge part of leadership.